Today we begin the week of weeks in the liturgical calendar: the Holy Week. Today we begin the commemoration of the high points in the history of salvation: the passion, death and resurrection of Jesus – the Paschal Mystery. Today we accompany Jesus on his solemn entry into Jerusalem where he will suffer, die and rise again. Yet, this day is a day of contradictions. In the gospel of Luke Jesus is on this single, long journey that he started from the little village of Nazareth (Lk 4:42-44) to the capital of the Jewish world – Jerusalem. Now he is almost there nearing his destiny. It is going to be a solemn entry, almost as a King is about to enter to take possession of his capital. And the procession begins at the Mount of Olives – the mount that is be the stage for the ultimate Day of the Lord (according to Zechariah 14:3-4), the day of judgement. Perhaps the people have some insight into what is happening. They throw their cloaks on the road as a sign of their surrender to the king. And they sing in acclamation. The lines they sing are partly borrowed from Psalm 118 (verse 26) that celebrates the kingship of the Lord. But here is a contradiction: the Lord rides on a donkey, and not on a horse. The horse could indicate a military, violent entry. So he has purposefully chosen a donkey, he makes a humble entry. As the prophet Zechariah once again reminds us, “Rejoice heart and soul, daughter of Zion! Shout for joy, daughter of Jerusalem! Look, your king is approaching, he is vindicated and victorious, humble and riding on a donkey, on a colt, the foal of a donkey” (Zechariah 9:9). This tumultuous celebration is not going to last long. We know from history what is going to happen. Perhaps Jesus knows too: after all, he has made a choice to be the suffering servant (Lk 4:1-12). Today, he makes a solemn entry into the city. Towards the end of this week, he will make a shameful exit to be hanged on a cross. Yet, that will not be his end. This week is going to quite eventful for Jesus, and for us too. My dear friends, let us live through these paradoxes during the coming week, together with Jesus. It is in living through the paradoxes is our salvation. Let us feel as he felt. Let us think as he thought. Let us pray as he prayed. It is in being united with him in his suffering, death, and resurrection is our own victory. What are we like? If we role-play the scene of the Gospel what would be our characters? I am reminded of the unscripted sermon of Pope Francis on Palm Sunday some years back. This would serve as food for thought for the entire week. He raises the compelling question of what are we as human being? Am I like Judas? A traitor who feigns the loved and then kisses the Master to hand him over, to betray him? Am I like the disciples? Who understood nothing and fell asleep while the Lord was suffering. Has my life fallen asleep? Or like the ones who did not understand what it is to be betrayed? Or pulls his sword to settle the score? Am I like Pilate? When I see that the situation is difficult, do I wash my hands and dodge my responsibility, allowing people to be condemned- or condemning them myself? Am I like those in Power, who hastily summons the tribunal and seeks false witnesses? Am I like the crowd that was not sure whether they were at a religious meeting, or trial or a circus, and then chose Barabbas? For them, it was all the same: it was more entertaining to humiliate Jesus. Am I like the soldiers who strike the Lord, spit on him, insult him, who find entertainment in humiliating him? Am I like the Cyrenean, who was returning from work, weary, yet was good enough to help the Lord carry his cross? Am I like those who walked by the cross and mocked Jesus? “He was so courageous! Let him come down from the cross and then we will believe in him.” Am I like those fearless women, and the mother of Jesus, who were there, and who suffered in silence? Am I like Joseph, the hidden disciple, who loving carries the body of Jesus to give it burial? Am I like the two Mary’s, who remained at the Tomb, weeping and praying? Am I like those leaders who went the next day to Pilate and said, “Look, this man said that he was going to rise again, and we cannot let another fraud take place? And who block life, who block the tomb, in order to maintain doctrine, lest life come forth? The above questions should accompany us in the Holy Week. We hear of many names in the gospel to today. WHO AM I LIKE? This victory is symbolized by the donkey that Christ rode into Jerusalem on the first Palm Sunday. The first symbolic meaning of the donkey shows us how Christ won his victory over sin and evil: through humility. A donkey is a useful beast of burden, but not a glorious and impressive one. And that’s exactly like the Christian virtue of humility, by which we lower ourselves in order to help raise up others, to serve them. Just as Jesus rides the humble donkey into the city of Jerusalem, so he rides the virtue of humility through this sinful world in order to blaze a path for us into heaven. He humbles himself to save us out of love. The second symbolic meaning is more directly connected to Christ’s victory. In ancient times, military commanders who were engaged in battle and conquest would ride on the most efficient beasts for war: strong, fast, powerful warhorses. But after a battle was won, the victorious general would parade into the city riding on – you guessed it – a donkey. That is why the people shouted out when they saw Jesus riding into Jerusalem on a donkey. It was a sign for them; it meant that Jesus had conquered and was bringing the peace of his Kingdom (though they didn’t yet understand what kind of kingdom it was). Everything in today’s liturgy – even the humble donkey – shines brilliantly with the aura of Christ’s amazing victory over evil and original sin. Which Victory Are We Celebrating? Today we hold in our hands palm branches. In the ancient world, palm branches were the symbol of victory. For the Israelites in the Old Testament, the elegance, strength, and simplicity of this tree became a symbol of the just man or woman, the one in whom God’s law triumphed. It also symbolized victory for the Romans. Palm trees were not native to Italy. And so, when the Romans started conquering other nations in the Mediterranean, the generals brought palm trees back to Rome as souvenirs of their victories. 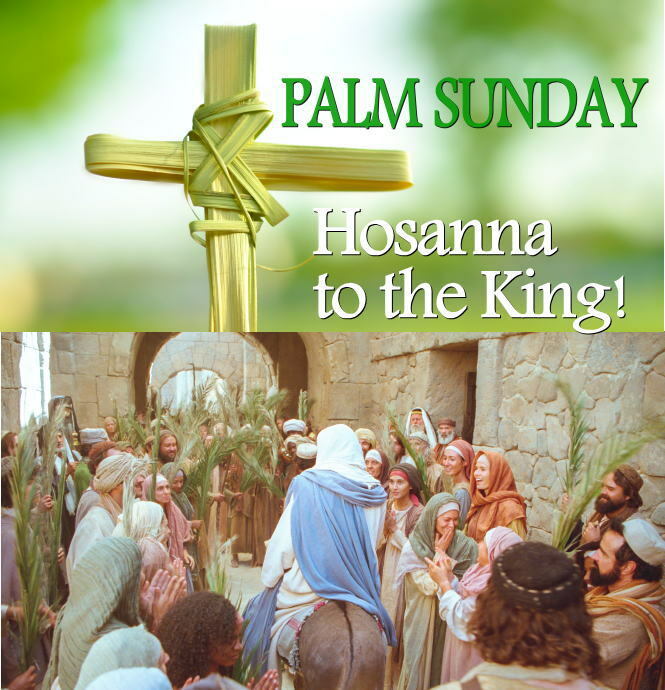 So the crowds waving palm branches as Jesus entered Jerusalem were declaring his victory. Today, we echo them, we join them, and we declare and celebrate Christ’s victory. But what victory is it? And how did Christ win it? It is the victory over original sin. Original sin was mankind’s disobedience to God and obedience to the devil. It shattered God’s plan, let loose the scourge of evil, and gave the devil a certain power over earthly society. The betrayal of Judas, the abandonment of his apostles, the false accusations, the condemnation, the humiliation, the scourging and crowing with thorns, the torture of crucifixion – all of these sufferings were the devil’s attempts to get Jesus to say “no” to his Father, just as he had gotten Adam and Eve to say “no”. But Jesus defeated the devil. He continued to love, forgive, and obey through it all. And so he, unlike Adam, unlike every other person in history, can say, “I have not rebelled” [first reading at the Mass]. His obedience establishes a beachhead in this world that is under the devil’s sway: Jesus’ Passion is D-Day for the devil, and liberation for us. This is the victory we celebrate. This entry was posted in English, Fr Franco, Lenten Season, Year C. Bookmark the permalink.